A SAFEzone is a confidential place (or person) where all people can bring their authentic selves and feel safe, welcomed and included. 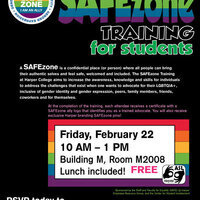 The SAFEzone Training at Harper College aims to increase the awareness, knowledge and skills for individuals to address the challenges that exist when one wants to advocate for their LGBTQIA+, inclusive of gender identity and gender expression, peers, family members, friends, coworkers and for themselves. At the completion of the training, each attendee receives a certificate with a SAFEzone ally logo that identifies you as a trained advocate. You will also receive exclusive Harper branding SAFEzone pins!